The Interlocking Hog Bristle series is one of our finest brush lines, and quite possibly the finest pure hog bristle you'll find anywhere. 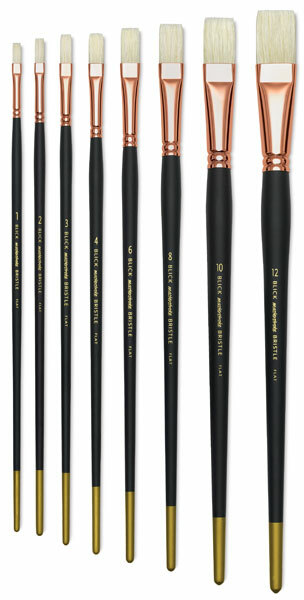 The very best craftsmanship goes into each brush, from the top-quality, hand selected white bristle to the accent of gold on the tip of the matte-black handles. The term "interlocking" refers to the abundance of natural flags, or splits, on the tips of the bristles — deep flags that lock together and produce a smooth stroke even with thick or heavy paints. 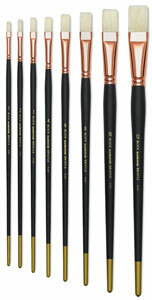 Set of 6 — Save on a set of six brushes of a single shape. Sizes included are 2, 4, 6, 8, 10, and 12.